NEW YORK (AP) — Keldon Johnson caught the ball near center court and heaved in a prayer of a shot at the regulation buzzer that sent Kentucky players and fans into a pulsating frenzy. Surely now, with all that momentum, the ninth-ranked Wildcats would finally take control in overtime and escape from New York with a hard-fought win. But this scrappy Seton Hall squad had a lot more left. Myles Cale hit a go-ahead 3-pointer with 9.5 seconds remaining and the Pirates overcame Johnson's half-court fling that tied the score, stunning Kentucky 84-83 on Saturday in a Madison Square Garden thriller. "I guess that was good for the fans," Wildcats coach John Calipari said. "Wasn't so good for the losing coach." Johnson had a chance to win it for Kentucky (7-2), but his 3-point try with a second remaining was blocked by Quincy McKnight. The ball went out of bounds as time expired, and excited Pirates players rushed off the bench to celebrate a huge win. Myles Powell scored 25 of his 28 points after halftime for Seton Hall (6-3), including a tiebreaking 3 in the final seconds of the second half. "It took a lot of effort, but ... we were ready," Powell said. "We fought, we never gave up, we stayed together and we got the job done." The clock showed 1.1 seconds after Powell's step-back, double-clutch jumper from the left side went through, but officials made it 1.5 seconds after a replay review. That made all the difference for Kentucky when PJ Washington inbounded from the baseline and threw a long pass to an open Johnson, even though the play wasn't designed for him to receive the ball. Johnson took a dribble, turned over his left shoulder and hurled a right-handed shot that went in as the horn sounded, tying it at 70. "I knew if I got the shot off that I had a pretty good chance to make it," he said. "It was a big shot. I mean, it was pretty big. I guess it just hurt because we lost." Kentucky rooters roared and Seton Hall coach Kevin Willard, stomping and pointing on the sideline only moments before, simply dropped his head in disbelief. A blue-clad crowd of 10,244, split between the schools probably in Kentucky's favor, was still buzzing as the teams got ready for overtime to settle the Citi Hoops Classic. "There's just something special about this place," Willard said. Washington had a career-high 29 points and grabbed 13 rebounds for Kentucky, which had won seven straight since a 118-84 blowout loss to Duke in the season opener Nov. 6. Reid Travis added 13 points before fouling out with 2:20 remaining in regulation. Johnson, the team's leading scorer at 15.9 points per game, was held to 10 after going scoreless in the first half. "I am not discouraged in any way," Calipari said. "We've got a ways to go. I mean, every year I go through this. This is painful and aging, trying to figure out your team, trying to win games while you're trying to figure them out, how you finish games and trying to get them to mature quickly. It's just hard. And you know what? I'm going to have to go through it again." Cale scored a career-best 17 on 4-of-18 shooting. With the Pirates trailing 83-81, he took a pass from Taurean Thompson on the right side, pump-faked a defender and drained an open 3 to send Seton Hall to its fifth victory in six games. "We practice that all the time," Cale said. McKnight had 15 points and five assists. Thompson, who missed Tuesday's win over New Hampshire with an ankle injury, contributed 13 points off the bench. Seton Hall quickly recovered from Johnson's incredible shot, scoring the first four points in overtime. A 3-pointer by Johnson with 43.9 seconds left gave the Wildcats an 82-81 lead, and Ashton Hagans made one of two free throws for Kentucky with 24.9 seconds to go. 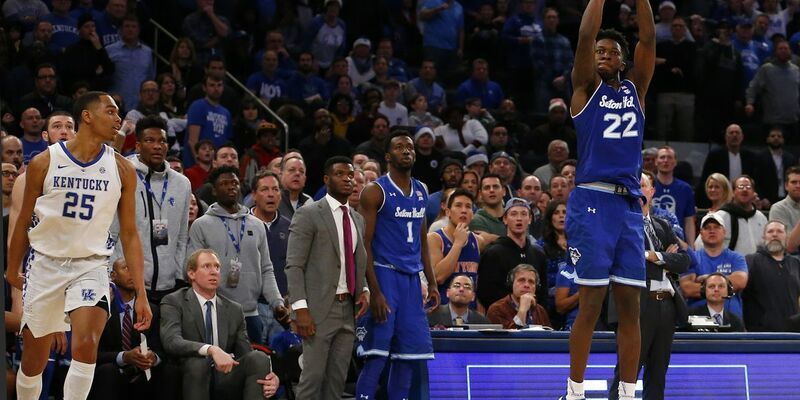 Seton Hall: The underdog Pirates pulled off the upset for a big resume-builder in their toughest test yet as they tune up for Big East play, which begins Dec. 29 against St. John's. After making three consecutive trips to the NCAA Tournament, including a win over N.C. State last season, Seton Hall is trying to duplicate that success with a new group led by Powell. Last season's senior class combined for more than 5,000 points, and only five Pirates on the current roster played for the team last season. Kentucky: The team's lack of perimeter shooting was exposed. Kentucky went 5 for 20 (25 percent) from 3-point range, including 0 of 6 by Tyler Herro. "We made strides. We're a better team than we were two weeks ago," Calipari said. "I've got a lot to figure out offensively." Willard blamed himself for eschewing his preferred philosophy and guarding the inbounder at the end of regulation. Still, his resilient Pirates wouldn't fold. "They bailed me out," he said. Seton Hall: Michael Nzei, Sandro Mamukelashvili and Jared Rhoden fouled out. ... Powell got hot late and finished 6 for 11 on 3s. ... Playing about 17 miles from their New Jersey campus, the Pirates improved to 9-3 at Madison Square Garden over the last three seasons. Kentucky: The Wildcats entered with the best rebounding margin in the nation, an advantage of nearly 17 per game, but only managed a 39-35 edge against the feisty Pirates. New York Yankees general manager Brian Cashman had a front-row seat along the sideline. Cashman went to high school in Lexington, Kentucky, before moving to Washington. Former New York Giants star Justin Tuck also was in the crowd. Kentucky: The Wildcats host Utah next Saturday before blue-blood games against No. 14 North Carolina and at rival Louisville. Seton Hall: Hosts state rival Rutgers next Saturday.